Fintech is a term applied to describe technological solutions developed in various financial services areas, such as online banking, and mobile payments, that are used in daily life by consumers. The development of financial technology further supports the growth of niche markets in Europe, such as the ever-developing alternative finance, crowdfunding and peer-to-peer lending, as well as automated loans, robo-advisors and automated investment management. Advancements in the development of financial technology are possible thanks to generous investments, both by venture capital firms as well as by the leading worldwide banks. As of February 2015, bank spending on new technologies in Europe was projected to reach nearly 11 million U.S. dollars in 2015 and increase to 15.3 million by 2017. This projection was not far behind the leading global Fintech economy, the United States. 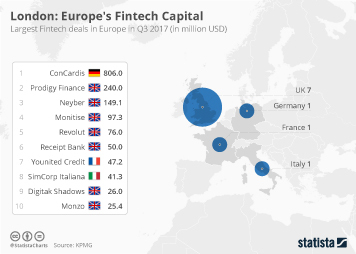 The value of quarterly venture capital investments in Fintech companies in Europe amounted to nearly 2.1 billion U.S. dollars as of the fourth quarter of 2017. In terms of leading countries, annual venture capital investments were highest on the British market, amounting to 1.8 billion dollars in 2017. Further proof of the dynamic nature of Fintech investments in Europe was provided by the inclusion of at least two European Fintech companies among the leading ten on the global Unicorn list as of July 2018. The high-ranked companies offering online payment solutions were the UK based BGL Group, and Klarna in Sweden. Traditional banks vacillate between seeing Fintech companies as either a chance at collaboration, a market threat or a future acquisition. Approximately 40 percent of British banks saw Fintech firms as possible collaborators in 2016. In contrast, 43 percent of French banks saw them as a possible threat. Consumers on the European market also play their part in increasing appetite for Fintech. In 2016, 47 percent of Spanish and 43 percent of Eastern-European consumers declared their willingness to switch their bank or insurer if these did not offer up-to-date financial service solutions.